Redline Racer is a car-crazy slot game that’s all about street racing! Street racing started to become extremely popular in the 1950s and this is where that slot takes you. A 1950s style logo sits on top of the reels, in front of a red and white chequered background – much like a race flag. NASCAR was founded in the late 1940s which is probably why street racing became so popular in the 50s! In fact, the world’s hit musical Grease was set in the late 50s! That musical is famous for its car race in which Kenickie was supposed to be competing but Danny Zuko had to step in and drive instead! He won, of course, and all the girls practically swooned for him. This slot game from Novomatic will remind you of this musical and will make you want to have been a teenage car racer in the 1950s! The symbols are all beautifully retro! There’s a red-headed beauty who’s waiting at the finish line to wave the flag and give the winner a kiss! There are plenty more symbols and plenty of features, too! 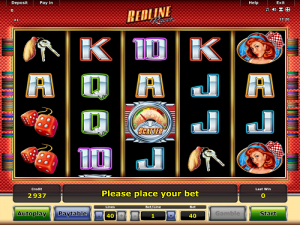 Redline Racer has 40 paylines which run across 5 reels. There are 4 rows so 20 positions on the reels in total. Redline Racer has Scatter symbols and Wild symbols and can give our Free Games! The Free Games come with an extra special feature that will help you speed your way to slot victory! You can play Redline Racer in manual mode or automatic mode and you can also gamble your wins using the classic Novomatic gamble game. The symbols in Redline Racer are a perfect mix of race car-theme and casino! There are symbols that show card values and symbols that are designed to look 50s! In terms of the card symbols, you’ll find: Ace, King, Queen, Jack and the 10. These symbols give the smallest payouts, although the Ace and the King give slightly higher payouts than the rest of the card symbols. Then, you’ll see the themed symbols! These are all picture symbols and they pay out the big wins! There are car keys with a lucky horse-tail key chain charm. There’s the fluffy dice that traditionally hand on the rear-view mirror. Higher payouts come from the gas pump, the flag girl and then the race car itself! This is the most valuable symbol on the reels. It’s red and has flames painted all over it! Symbols pay out for 3, 4 and 5 matches across a payline. The matching symbols must fall on paylines and on consecutive reels, otherwise they won’t pay out. The payline pay from the left to the right, so that’s how the symbols also have to fall. Even if you spin three matching symbols and they land following a payline on reels 3, 4 and 5 – they still won’t pay! Keep your eye on the leftmost reels (reels 1 and 2) so you can see when you’ve spun yourself lucky! You can spin each time by clicking the ‘Start’ button or you can press ‘Autoplay’ and then you won’t have to keep clicking. You can get more than one win each spin as there are 40 paylines. You can activate however many of these you like. Then you set your bet per payline and off you go! There’s one more symbol in Redline Racer and it’s not quite an ordinary symbol. This symbol is the speedometer and it’s special because it’s the Wild, the Scatter and the Free Games trigger – all in one symbol! When this symbol lands on a position where it can help complete a win, it will act like a Wild and substitute for the missing symbol(s). When three or more speedometer symbols land, in any positions, it will act as the Scatter symbol! This will trigger the Free Games! In Redline Racer, you get 8 Free Games at a time. The Free Games come with a feature that helps you get bigger wins! Every time this special speedometer symbol lands on the reels during the Free Games, the wins from the race car symbol will get bigger and bigger! Each time one lands, it will advance the race car symbol to the next level. There are four levels in total each time the car levels up, it will give out bigger wins. When the car makes it to the last level, every time the speedometer symbol lands, instead of increasing the wins, it will award you 1 additional Free Game!